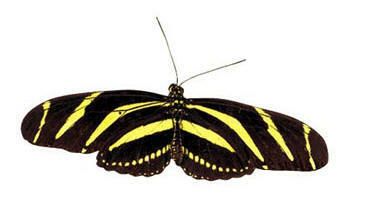 The striking black and yellowish bands on the upperside of this butterfly give rise to the common name. The underside is similar, but there are red spots at the wing base. The males patrol for females, and are also attracted to the female chrysalids. A male will wait on the chrysalis and mate with the female as she is about to emerge. He then deposits on her abdomen a chemical that repels other males. Adults roost communally in groups of 25-30 individuals. The adults ingest flower nectar and pollen.